Some people love to play video games, but their life gets in the way. They can’t spend the whole year playing an Elder Scrolls game and remember where they left off a month ago. So, for people with this problem casual games dominate their time. They can pick up and play and not have to worry about story line. Here are the top five casual games, both new and old, mobile and not. To feed your gaming addiction when life doesn’t allow you to sit for 24 hours straight. Angry Birds is on the list for launching a mobile revolution. 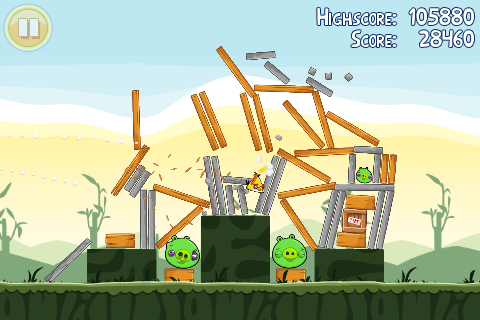 Catapulting birds and demolishing their enemy is the only goal of the game. This simple game has its own challenges, but what makes it successful is that it can be understood and played by anyone. Good mobile games existed before Angry Birds but this game created a phenomenon and now Angry Birds merchandise can’t be avoided. Smart phone and tablet gaming became a serious threat to traditional handhelds after this game. Like slashing fruit carelessly? Fruit Ninja is the perfect time waster for you. Similar to Angry Birds, Fruit Ninja has solidified the mobile gaming market into a formidable force against traditional gaming. They are cheap, many times offering free versions, and fun. Games for mobile devices must remain simple and easy to use. Fruit Ninja’s simple finger swiping controls attracted Microsoft as a great game to port to Kinect. 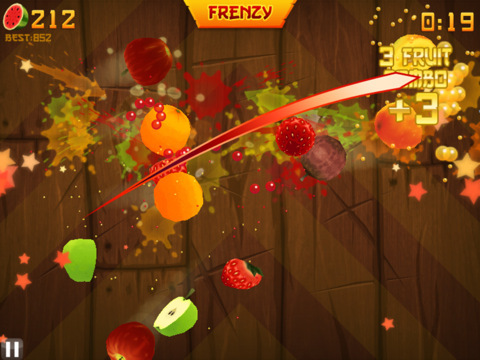 Fruit Ninja’s success inspired developers to make games with the same concept. Veggie Samurai emerged after Fruit Ninja success, making two changes, one instead of fruit you slice vegetables, and two, you can dice, which is cutting your vegetables more than once. These are reasons Fruit Ninja is one of the best games for your mobile device. Words With Friends, is Scrabble for idiots. Why? You can sit there and try every letter combination to make the most insane and mysterious words possible, or you can go on the Internet and look up words. No one needs to spell well to excel at this game. 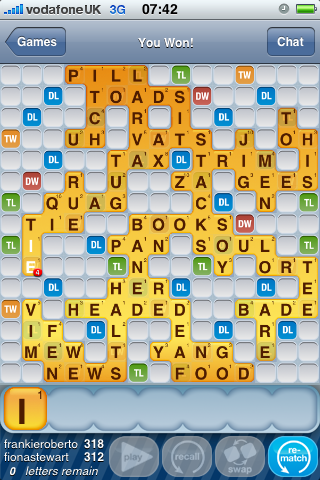 Words With Friends, playable on mobile devices and Facebook, has exploded onto the scene. College students sit with their laptops and play this during class. Zynga has expanded the brand to Hanging With Friends, which is a Scrabble and Hang Man hybrid. Hanging With Friends still allows for an easy outlet for cheating, if not easier, so next time you lose to a friend who can’t spell their way out of a paper bag, remember they probably cheated. 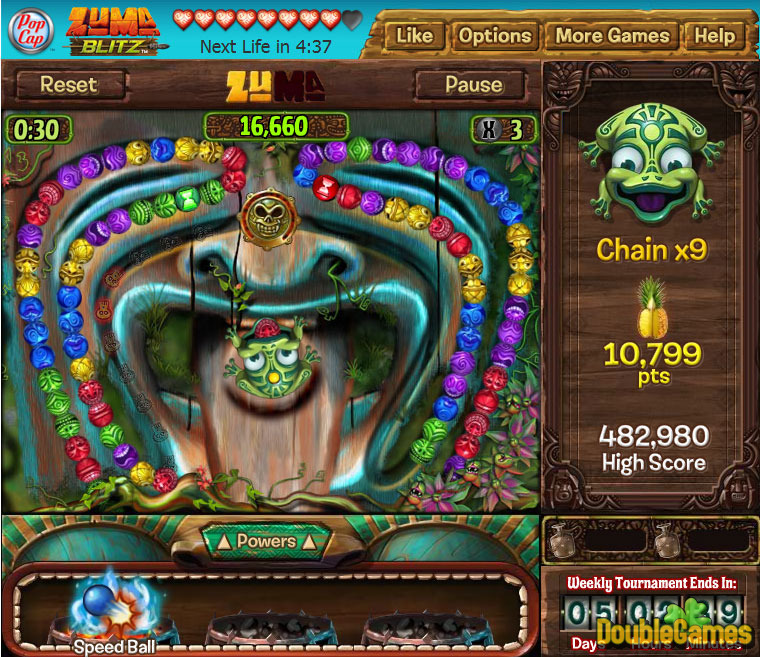 Zuma Blitz, especially on Facebook, is the perfect game to unwind after a long day of work or school. A balance between friendly competition and not thinking about what you’re doing makes this game peaceful and exciting at the same time. On Facebook PopCap holds weekly tournaments to see who of your friends gets the highest score. The skin is changed every week and scores are reset. Zuma offers powers to boost performance, but you can only use them if you have enough mojo. On Facebook the game offers a life system, which allows for about an hour of uninterrupted game play, perfect for lunch breaks. It has a great leveling up system making you feel accomplished and actually good at the game. A classic in a new skin. Bejewled is a classic. No list on casual gaming is complete without it. 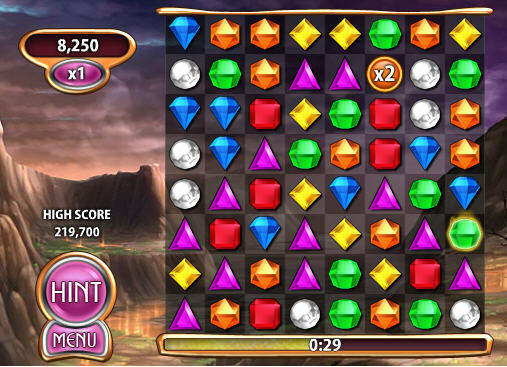 Similar to Zuma, Bejeweled has a Facebook version perfect for besting your friends. Bejewled innovated the puzzle game world. The idea of matching colors paved the way for great games like Zuma, and a personal favorite Lumines. Kindle Fire an iPad Killer? The iPad has been a staple in the tablet market since its inception. The Apple brand, the amount of apps available and its ability to watch T.V. and movies has kept the iPad from fearing any competitor that emerges. Now Apple might have some fear in its eyes. Amazon’s Kindle Fire will launch Nov. 15th. The Fire will come with many features already available on other tablets including, apps and games, books, magazines, and web browsing. However, the Fire will host a new web browser called Silk. The Silk browser splits its resources between the cloud and what is run on the device, theoretically making surfing quicker. According to a video on Amazon’s Silk blog, the difference in time between a traditional browser and Silk is waiting hundreds of milliseconds and waiting five milliseconds. Also the browser will aggregate user behavior, so if a majority of users tend to move to a certain page after the homepage the browser will start sending the information before you decide to go that page. The Fire will also offer thousands of movies, television shows, songs. Now the question is will these push the Fire to compete with the iPad or just wander aimlessly in the market like the other tablets available. The Fire will be significantly cheaper than the iPad launching at $199 instead of iPad’s starting price of $499. Amazon’s Kindle series has a brand identity that the other tablets don’t have. This is the main reason the Fire has a chance to directly compete with the iPad. Since most features of the Fire are consistent with what tablets offer. Price and brand are going to dictate the Fire’s success in the tablet market. Apple’s iPad will continue to hold the top spot after Fire’s launch. However, the Fire offers a viable alternative to the iPad, and a solid second place.